Corfe Bears > Charlie Bears > MINIMO BEAGAN 6"
BEAGAN is part of a new mini series of little mohair bears called called "It's all in the name" and this is because each one has the word 'little' in the meaning of it's name. Beagan is a boys name, of Gaelic origin and means "Little One". He is made from camel coloured short-pile mohair and the pads and inner ears are made from the flecked backing material, which looks very effective. He wears a collar of bells, so will tinkle when you hug him! He also has a fluffy bib of longer mohair on his front and a pale cream muzzle, which makes his dark brown hand-stitched nose stand out and the dark eyes are very appealing. 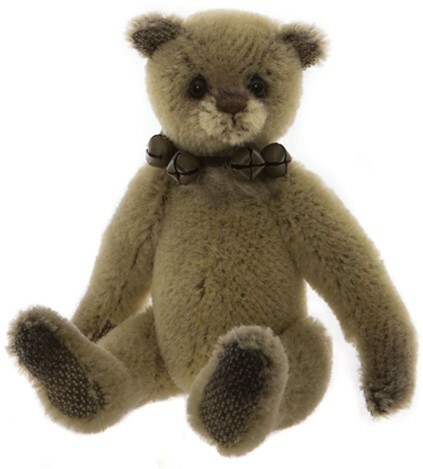 Beagan Minimo is a fully-jointed, miniature mohair bear from the Charlie Bears 2019 Minimo Collection.